David is a partner in our Dundee office, from where he heads up EQ Taxation for the firm. A qualified Chartered Accountant and Chartered Tax Adviser for more than 20 years, David leads our tax team in delivering an imaginative, relevant tax service to our clients, in the East of Scotland. 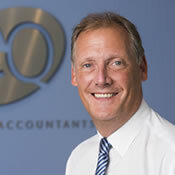 David runs a significant client portfolio with particular expertise in the leisure and professional services sectors. He operates as a trusted business adviser to numerous family businesses where he provides support at board level, with a friendly and forward thinking style. David himself specialises in business taxation, in particular business restructuring and Research & Development tax credits where the firm’s clients have saved millions of pounds. He is also a regular public speaker on a wide range of taxation matters.